What better way to fight the Monday blues than with another helping hand in tackling the dangerous world of market speculation with the help of non other than Pandemic Legion pilot, Forlorn Wongraven. In my last article I talked about speculation based upon interpretation of devblogs. Gathering valid information and adapting early to upcoming changes is necessary to be competitive and minimize risk. As a marketeer you require knowledge about the meta and what CCP has planned in the short, medium and long term. During Eve Fanfest or other events such as Eve Vegas, different CCP developers give presentations on their work. Usually the CSM minutes from the relevant summit in Iceland also provide some insight to the development of Eve. Unfortunately, as we learned recently with summer summit minutes debacle, the information obtainable from the minutes in the future is likely to decrease. CCP Diagoras stopped working for CCP in 2012 but before that provided intriguing statistics from time to time. In addition, the community has already lost the Quarterly Economic Newsletters that CCP’s economist, Dr. EyjoG, used to publish and which provided a good overview on Eve’s market, population and inflation. The last QEN was released in November 2010. We learned in the latest minutes that these will not return unless demand by both the CSM and the playerbase is high. CCP promised to work on publishing this data ‘in a proper accessible way’ but probably not soon™. Realtime monitoring used to be my main information tool but CCP’s views and policies on cache scraping have changed over the years. 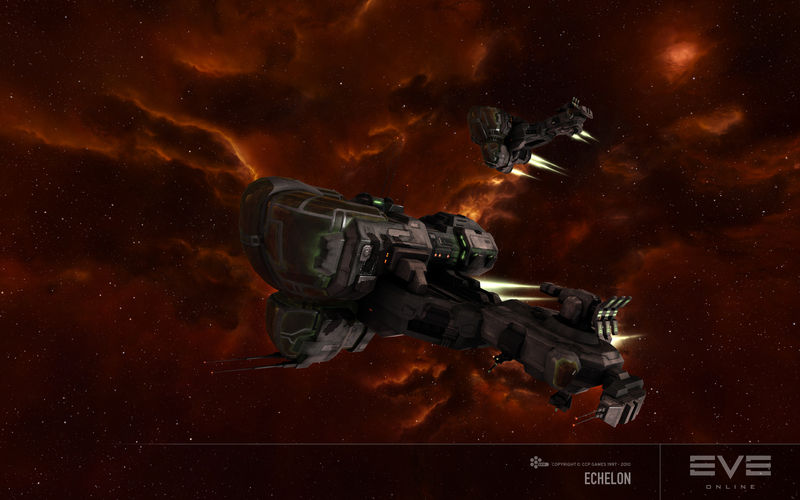 In a devblog in early 2013, CCP Stillman stated that cache scraping violates the EULA but as long as it is not combined with other illegal activities, CCP will not take action against a subscriber. I have since disabled the cache scraping in my market tool and use the ~grey area~ data provided by Eve-Central. Another very useful tool for collecting market data is provided by a member of the community named Sarmatiko. He not only provides up-to-date renders of new ship models and skins but also releases data dumps from CCP’s developer servers, Chaos and Singularity. Before Odyssey was released, the playerbase received a presentation on the new exploration features during Fanfest. Very early I saw on the data dumps that a special gift module was going to be the hacking module with the best stats: the Purloined Sansha Data Analyzer. However this module could only be fitted on the Echelon – a Christmas present given to players in December 2010. This information was not on the in-game attribute tab before Odyssey. When the Echelon was gifted, you could reproduce those mods by assembling and repackaging. Every time you assembled the ship, a magic new mid-slot analyzer would appear. I remember that this was broken but wasn’t sure if it ever got patched out – turns out it did. I made sure and let people know that this module was OP. 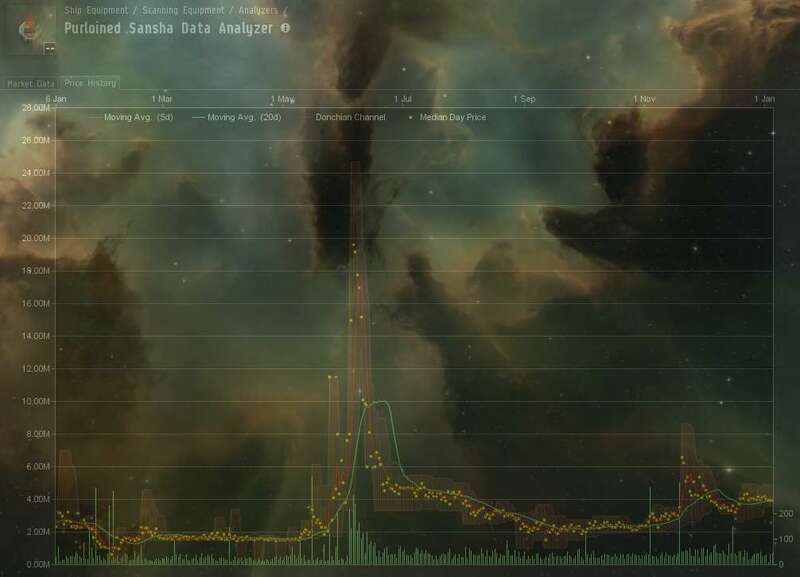 If you look at the price history of the Analyzer you can see my alt buying off all modules available on May 16th 2013 with a 500 mil ISK investment. Somebody else followed my example and bought all available Echelons in Jita on the same day. And again I had to wait for patchnotes and patchday. For two weeks the market slowly climbed with low numbers of traded items. Within 3 days I was able to sell my stockpile with a profit of 2.6 bil ISK for a worthless module that only can be used on a ship that has no high-slot for a probe launcher needed to find signatures. Showing that ship speculation does not work as well as module speculation, the Echelon itself was only sold for double its value with a very low number of traded ships. So far Odyssey has been good for my wallet with a 7.2 bil ISK profit out of a mere 1.5 bil ISK investment and around two hours of my time. In my next post I will take a look at expansion speculation with a traditional approach and future outlook.